Regular readers know that one of the important gauges I rely on is the Baltic Dry Index to forecast the health of the global economy. The Baltic Dry Index tracks world-wide shipping rates of dry bulk commodities such as grain, ore, coal, etc. and it is not subject to manipulation and intervention because shippers don’t book cargo unless they have something to ship. Notice how the current level is as low as the recession of 2001 – 02 and the crash of 2008. Analysts point out that major ship building in the last couple of years has increased the supply of ship capacity. No doubt that has some influence but it overlooks older, surplus ships being mothballed and certainly doesn’t account for a 50% drop in one day. In fact, from the long-term chart below, you can see the long term downtrend. The Index is in a bear market. So, why is this important? Let’s do a quick review. America is in a Depression. The EU, the world’s largest trade bloc (population 380 million) is melting down and going into another recession. The world’s 3rd largest economy, Japan is entering its 3rd recessionary “lost decade” and the whole world is waiting with bated breath for China, the manufacturing giant, to save us all. In other words, China has captured so much global manufacturing that the Baltic Dry Index is, in fact, a leading economic indicator of the Chinese economy. And, last Friday, the Chinese economy fell off a cliff. China is not going to save the world. It can’t even save itself now. Stay tuned. 2012 is going to be a painful year. Much has been said about the Baltic Dry Index over the course of the last four years, especially in light of the credit crisis and the effects it has had on the frequency of global shipping. Importing and exporting has never been quite the same since 2008, and this change is made most obvious through one of the few statistical measures left in the world that is not subject to direct manipulation by international corporate interests; the BDI. Today, the BDI is on the verge of making headlines once again, being that is plummeting like a wingless 747 into the swampy mire of what I believe will soon be historical lows. The problem with the BDI is that it is little understood and often dismissed by less thoughtful economic analysts as a “volatile index” that is too “sensitive” to be used as a realistic indicator of future trends. What these analysts consistently seem to ignore is that regardless of their narrow opinion, the BDI has been proven to lead economic direction in the market movements of the past. That is to say, the BDI has been volatile exactly BECAUSE markets have been volatile and unstable, and is a far more accurate thermometer than those that most mainstream economists currently rely on. If only they would look back at the numbers further than one year ago, they might see their own folly more clearly. In late 1986, for instance, the BDI fell to its lowest level on record, then, began a slow crawl towards moderate recovery, just before the Black Monday crash of 1987. Coincidence? Not a chance. From 2001 to 2002, a similar sharp collapse in the BDI preceded a progressive drop in the Dow of around 4000 points, ending in a highly suspect (Fed engineered) illegitimate recovery. In 2008, the index fell to near record lows once again just before the derivatives and credit crisis hit stocks full force. To imply that the BDI is not a useful measure of future economic trends seems like an astonishingly ignorant proposition when one examines its very predictable behavior just before major financial downturns. This is not to suggest that the BDI can be used as a way to play the stock market from day to day, or often even month to month. MSM analysts rarely look further than the next quarter when considering any financial issue, and that is why they don’t understand the BDI. If an index cannot be used by daytraders to make a quick buck in a short afternoon, then why bother with it at all, right? The BDI is not an accurate measure of the daily market gamble. It is, though, an accurate measure of where markets are headed in the long run and under extreme circumstances. Another subversive argument against the BDI is the suggestion that it is not the demand for raw materials that is in decline, but the number of shipping vessels out of use that is growing. A smart person might suggest that these two problems are mutually connected. An MSM pundit would not. In 2008, many ships were left to wallow in port without cargo, but this was due in large part to two circumstances. First, demand had fallen so much that too many ships were left to carry too little raw materials. Second, credit markets had sunk so intensely that many ships could not find trade financing necessary to take on cargo. In either case, the BDI still falls, and in either case, it still signals economic danger. The only way that the BDI could signal a major decline in shipping demand artificially or inaccurately is if a considerable number of ships under construction were suddenly released onto the market while there is no demand for them. There have been no mass increases or extreme changes in cargo fleets this past month, or at all since 2008, which means, the BDI’s decline has NOTHING to do with the number of ships in operation, and everything to do with decline in global demand. What is the bottom line? The stark decline in the BDI today should be taken very seriously. Most similar declines have occurred right before or in tandem with economic instability and stock market upheaval. All the average person need do is look around themselves, and they will find a European Union in the midst of detrimental credit downgrades and on the verge of dissolving. They will find the U.S. on the brink of yet another national debt battle and hostage to a private Federal Reserve which has announced the possibility of a third QE stimulus package which will likely be the last before foreign creditors begin dumping our treasuries and our currency in protest. They will find BRIC and ASEAN nations moving quietly into multiple bilateral trade agreements which cut out the use of the dollar as a world reserve completely. 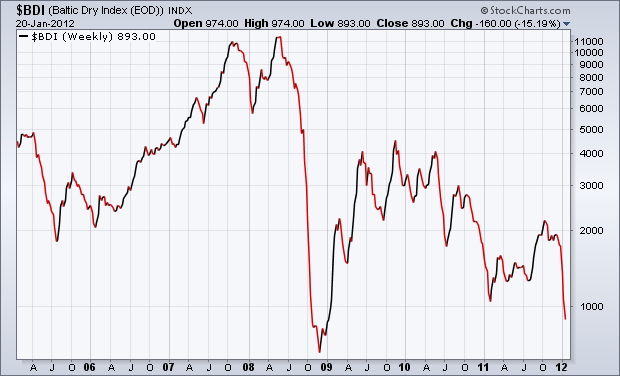 Is it any wonder that the Baltic Dry Index is in such steep deterioration? This entry was posted in Collapse 2012, Economic Collapse and tagged Baltic Dry Index, China, Economic Collapse, Great Depression, Greater Depression, leading economic indicator. Bookmark the permalink. That was well worth it. penny stock I don’t even know how I ended up here, but I thought this post was good. I do not know who you are but certainly you are going to a famous blogger if you are not already 😉 Cheers! Such a great article . Thanks.I too beeilve that baltic dry index can be used to see overall direction of worldwide economies. So this sharp fall tells us that we are in perfect bear markets and the jump we recently saw in stock markets worldwide is definitely a typical bear market rally meant to trap investors.Going forward, i do see markets falling (ofcourse we cant and we shouldnt time the fall) but the overall direction of trade should be downwards. The fall may be similar to or worser than 2008.Investors should short on every rise in these bear markets (like we buy on dips in bull markets) and then wait patiently to let their Selling position generate long term profits. Commodities have started to cool off now and if they start to fall considerably, we will probably see the fall very soon. Such a great article…. Thanks. I too believe that baltic dry index can be used to see overall direction of worldwide economies. So this sharp fall tells us that we are in perfect bear markets and the jump we recently saw in stock markets worldwide is definitely a typical bear market rally meant to trap investors. Going forward, i do see markets falling (ofcourse we cant and we shouldnt time the fall) but the overall direction of trade should be downwards. The fall may be similar to or worser than 2008. Investors should short on every rise in these bear markets (like we buy on dips in bull markets) and then wait patiently to let their Selling position generate long term profits. Commodities have started to cool off now and if they start to fall considerably, we will probably see the fall very soon. Good analysis. I agree that, although we can see the direction, the timing is always difficult to predict. Shorting the rises will be the only way to profit in a falling market but some investors are frightened of short-selling or can’t if they’re in registered pension plans. However it’ll be the only way to make money in a falling market. The alternative is sit on cash and lose to inflation. BTW – yesterday “American Shipper” reported January U.S. rail shipments are already down in January.